A wonderful group show opens this evening from 5-10 p.m. in suite 332 of the Northrup King Building. 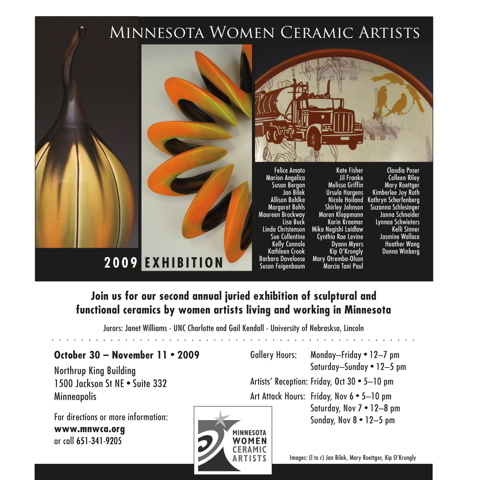 The show consists of sculptural and functional ceramics by women artists living and working in Minnesota and was juried by Gail Kendall and Janet Williams. I am proud to be part of such a talented group. I’ll be gallery sitting on Monday, November 2 from 12-4 p.m. if you want to avoid the crowds. This entry was posted on Friday, October 30th, 2009 at 12:37 am	and is filed under Main. You can follow any responses to this entry through the RSS 2.0 feed. You can skip to the end and leave a response. Pinging is currently not allowed.